Just for interest, here are some screen caps of the current development testing of the TigerTool software. The hardware being used is my own design of the OBD2 interface as I can't rely on the cheap units for what these new features need. The new 'Instrument' tab (replaces 'SIA Reset') reads the current ODO value and automatically adds the service reset distance to the ODO value to show when the next service is due. It also senses the current ODO units automatically (km or miles) and displays the appropriate units. There are some menu configurations added too. This tab might make its way into the next release of the software. • Program new sensors into the ECU! 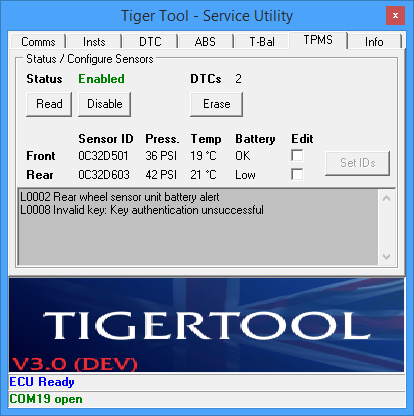 Unfortunately, the new TPMS tab & features probably won't make its way into the next TigerTool release due to the need for different (much better) hardware. If there's enough interest in the TPMS features I might look into the cost of building the OBD2 hardware to see if it might be viable. The TPMS control should be usable on any of the current Triumph models that support the feature. are you ever likely to go down the route of key programming? As in coding new ignition keys to the ECU? In which case, I've been looking into it but it's more tricky than getting TPMS access, so no luck so far. I can see (I think) where the key transponder data is stored but that's about all the access I've managed so far. I welcome the addition of the TPMS option. Other than updates, that is the only reason I've had to take the bike in. Do you think it will you be able to set the low pressure warning limit? Great job on this tool. I know this takes a lot of time to program something. And then to share it and support, even more so. Thank you. Depends if the dealers can do this. I'm not sure they can, in which case I doubt I'll be able to either. Would be nice to have some control over when the light comes on though. I asked the dealer if they could alter the TPM values, they said they couldn’t. They are barred from taking off switch cubes too. I have installed the TPMS and I do not want to go through the dealership to edit them. With the new Tigertoool I could edit them without going through the dealership. 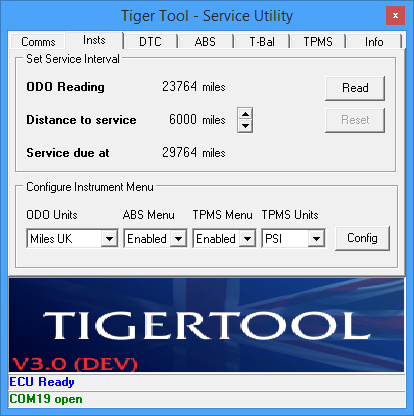 The new stationary Tigertool to download it would be very useful for my.